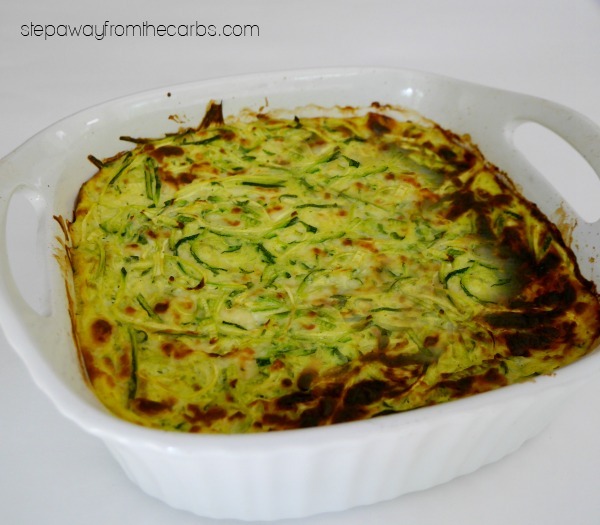 This zoodle bake is made from zucchini and cheese, and is a wonderful low carb side dish recipe. 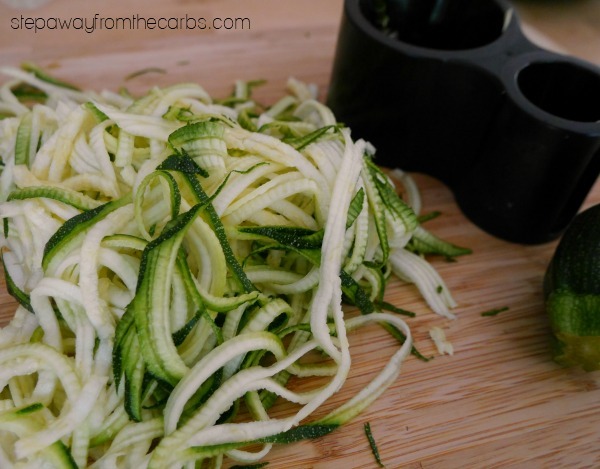 If you haven’t come across the “zoodles” before – it is a contraction of the two words “zucchini noodles”. I have some great information about them HERE. 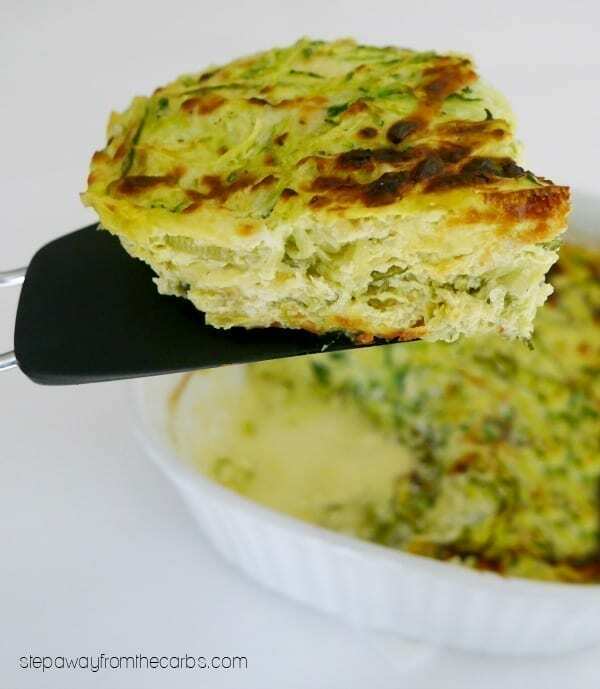 They can be used for so many recipes, and they work really well in this Zoodle Bake. When I wrote my zoodle information post several years ago, my preferred tool was a julienne peeler. Now it is much easier to find them pre-spiralized in grocery stores which is super convenient! I used pre-made ones in my Steak with Creamy Chipotle Sauce with Zoodles recipe. Buying them ready-made isn’t the cheapest option, however, and as I still haven’t splashed out on a Spiralizer, my preferred tool is this hand-held spiral slicer from Microplane. It doesn’t take up much space in my kitchen cupboards, and it works really well for zucchini. 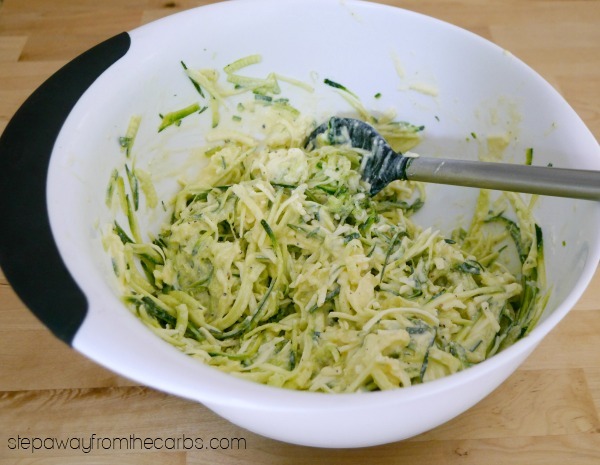 Make the zucchini into noodles using whichever method you prefer, then set them aside. Note: Try not to include the core of the zucchini, otherwise the finished dish may be too watery. In a large bowl, whisk together eggs, ricotta, baking powder and a lot of black pepper – a balloon whisk is all you need for this. Stir in some grated mozzarella and the zoodles. 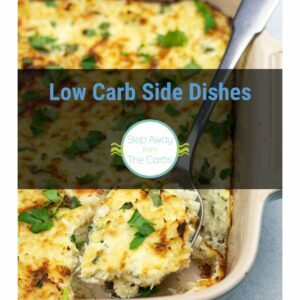 At this point you could add in any other flavorings that you fancy – herbs, spices, cooked bacon – whatever you like! 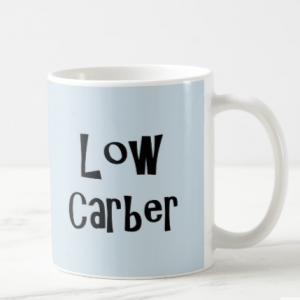 Just remember to add them to the carb count if necessary. Transfer everything to a baking dish (mine was 9×9″), and cover in foil. Bake for 15 minutes in a preheated oven, then remove the foil and bake for another 15-10 or until the middle of the bake has set. Leave for 5 minutes to cool slightly before dividing into four portions and serving. In a large bowl, whisk together the eggs, ricotta, baking powder and a lot of black pepper. Stir in some grated mozzarella and the zoodles. Transfer everything to a 9x9" baking dish, and cover in foil. Bake for 15 minutes, then remove the foil and bake for another 15-20, or until the middle of the bake has set. Leave for 5 minutes to cool slightly before serving. This zoodle dish looks delish! I bought presliced zucchini and I’d like to know how many cups 3 zucchini would be. I don’t have any to measure at home right now, but CooksInfo suggests that 3 medium = 3 1/2 cups sliced. Source: http://www.cooksinfo.com/zucchini Hope that helps! 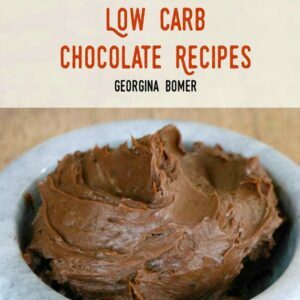 I’m anxious to try this but I was wondering if you could tell me what the purpose of the baking powder is? 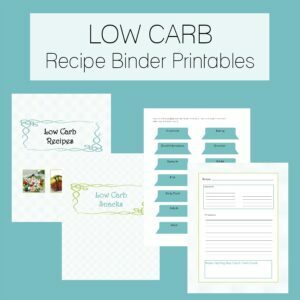 It’s about creating a lighter texture of the egg and ricotta mixture binding everything together. Feel free to try it without and let me know how it goes!